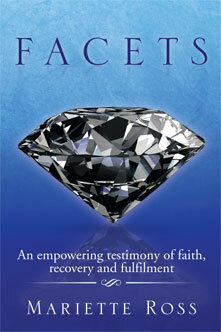 FACETS is a testimony of my journey – a journey of joy and happiness, failures and disappointments, despair and brokenness. It took a lot of courage, strength and tenacity to piece my life back together again. Armoured with spiritual ignorance and oblivion I faltered and failed in my efforts. As a last resort I turned to the ONE who picked me up and set me on solid ground. God’s unfailing love shone brightly in my darkened world of struggles and the resilience I experienced was a turning point in my life which inspired me to share my story and I feel privileged to be of service to Him.